North Platte girls basketball coach Karl Matt said in all his years of coaching, he has never seen the amount of injuries sustained by the Lady Panthers so far this season. Coming into last Friday night’s KCI Conference clash with East Buchanan in Dearborn, the North Platte squad already had three players out with injuries. Sophomore Kaycee Hodgson broke her leg near the end of the softball season and has yet to play. Sophomore Maddie Lee broke her hand earlier in the season and junior Sarah Johnson was sidelined with a knee injury. As if that wasn’t enough, the injury report got longer in the first half Friday when Emmie Lee turned an ankle and was forced to the bench. Normally when a small-school team such as North Platte incurs that amount of injuries, the roster is depleted and the team is forced to play players who otherwise would not see many varsity minutes. Fortunately for North Platte, this year’s team is built on a deep bench. The result is the Lady Panthers for the most part have not missed a beat so far. They pummeled East Buch 55-24 in its last action of 2013 and improved to 6-1 on the season. Their only loss came to Lawson in the semifinals of the KCI Tournament. “Luckily, we have a lot of depth,” Matt said. “The plan all along was to play 10 or 11 girls.” After Emmie Lee went down in the first quarter Friday, Matt had eight available players. When two of them got three fouls midway through the second period, Matt said he was forced to go into the delay game on offense. “With the injuries and the fouls, I had to shorten the game or we may not have been able to put five on the court late in the game,” he said. 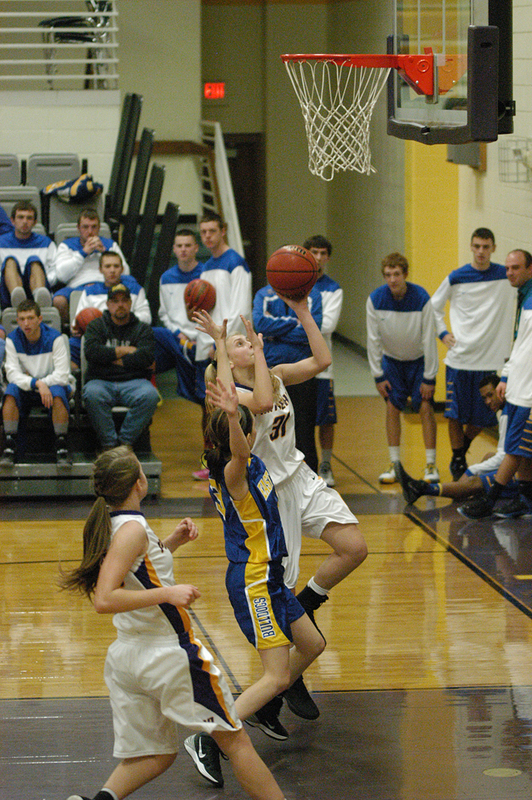 The strategy did not hurt North Platte, who eventually used a 14-0 spurt to take a 34-11 lead into halftime. The Lady Panthers kept the pedal to the metal in the second half, putting the game out of reach with an 11-0 run to start the fourth period. Junior Courtney Kipping and sophomore Erin Manville paced a balanced North Platte scoring effort with 12 points apiece. Senior Maddie Roberts added nine points. Roberts and Manville each said after the game that the Lady Panthers, despite the injuries, are coming together much quicker than last season. Of course, that team featured many freshmen and while North Platte wound up 18-9 on the year with a fifth straight district crown, it was still a letdown of sorts from the previous two final four seasons. “I think we are working really well together,” Roberts said. “Going back to state is definitely a goal — I think we’ve got the team to do it.” Manville said the Lady Panthers’ team is more than just the sum of its parts. “We all have strengths that we bring to the team,” she said. “We really complement each other and we’ve grown a lot since last year.” Matt said his team could be a force to reckon with, especially when it gets completely healthy. “We are playing well right now, but when we get all these girls healthy, it could be a lot of fun,” said Matt. He said that his team definitely needs the week off he is giving them and added that Emmie Lee could return to practice then. Matt expects Maddie Lee, Hodgson and Johnson to return in “mid-January.” North Platte returns to the court at the Trenton Shootout Jan. 2-4. The Lady Panthers return home Jan. 7 against Maysville.